Diver BI Group Accolades BARC Survey 2012 – DI achieves Top or High positions in 21 categories! Dimensional Insight achieves Top or Leadership positions in 21 survey categories, across three BI peer groups. BURLINGTON, MA – OCTOBER 18, 2012 – Dimensional Insight, a leading provider of business intelligence (BI) solutions, today announced that, in an independent survey of companies using business intelligence software products, Dimensional Insight ranked #1 in 13 categories, and ranked as a leader in numerous additional categories. 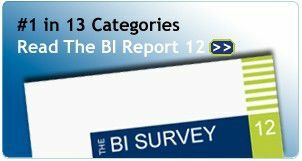 The BI Survey 12, conducted by the Business Application Research Center (BARC), is the world’s largest independent survey of Business Intelligence and Performance Management users. –Quotes by Carsten Bange, BARC author.